Here’s the scenario. You’ve got people asking you to express your strategy as a set of milestones extending through a certain amount of time. This puts you in the mindset of building out a timeline and dropping in various important strategic events you see happening in the future. But even if you try to limit yourself to the next 6 months you struggle with the perceived precision of showing things happening on certain dates or even in certain months. 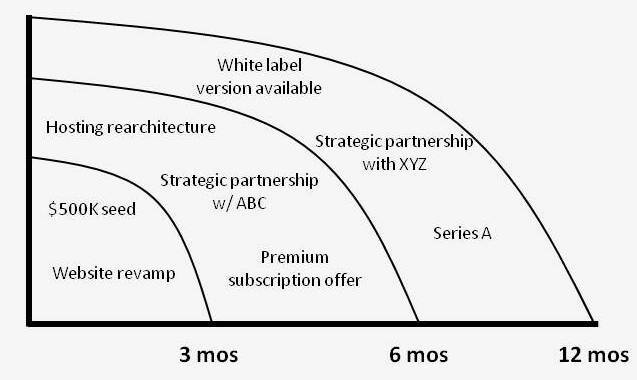 Instead of a timeline, show your strategic milestones in what are referred to as “strategy horizons”. It’s as simple as breaking the timeline into three horizons. Two is minimal but I tend to prefer three. A one year projection might be broken into next 3 months, 3-6 months and 6-12 months. Now all you need to do is decide which horizon to drop your various strategic milestone events into. MUCH easier and yet something that conveys your strategy in a way that investors (or investor prospects), board members, strategic partners or candidates for executive employment positions can digest with solid understanding. The vertical axis doesn’t represent anything in particular unless you decide to have it represent significance. But the main idea is to create “buckets” (horizons) for dropping your various strategic milestones into. And you get to decide what represents a “strategic milestone”. I just provide a few examples. As you grow and can plan/predict further into the future, double the duration of each horizon so that the graphic extends to 24 months. Want to create your own strategy horizon graphic? Click here for a blank PowerPoint template. The above concept has also been included as a template in an online visual planning and strategy tool called Cnverg. Check it out. This is actually very helpful!